The House of Retreat is situated at the edge of a small, moated village in the heart of the Essex countryside and is a place of prayer, space and quiet reflection. A reflective and exploratory day for anyone who is out of work or facing the prospect of being so. There is also the opportunity for family, friends and others to better understand some of the pressures that unemployment can bring. A day for ministers, pastoral workers and anyone affected by unemployment. (Bursaries are available to make the day affordable to all.) Revd Lara Dose has been the priest-in-charge at St. Andrew's Romford since July 2012. She is also Lead Chaplain for the Romford Town Centre Chaplaincy Team. You are invited to come and visit the Retreat House and gardens, have lunch outside (weather permitting) and enjoy the numerous stalls (some new for this year) that have been invited for the day. 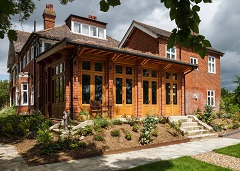 This is the major fundraising day of the year for the House and the Friends and is always a wonderful day of fellowship for new and old visitors. . Entry is free, although a donation to the funds is always appreciated. Music is a very powerful medium through which we can release our worship to God. This enabling and teaching weekend with Dave and Pat Bilbrough is designed to help us 'raise the bar' creatively as we do that. Appropriate for delegates of all levels of musical ability. Topics will include.... The heart of worship, leading worship, songwriting, Singing,Percussion. Dave & Pat Bilbrough - As one of the fathers of the modern day worship movement Dave songs such as Abba Father,All Hail the Lamb,Let there be love,I am a new creation and others have been sung around the globe. Still touring and recording continues to encourage and facilitate others to worship God in fresh and expressive ways. From leading choirs in auditoriums around the world through to interactive percussion workshops Pat has shared her skills in many diverse situations. She is recognised as a leading vocal coach and skilled percussionist. A natural and experienced teacher, you will find yourself motivated and equipped to reach new musical heights through a sessions. "Rhythms of the Soul: Finding deeper communion within everyday life". In this evocative Quiet Day, Brian will lead us into a rich and soulful space through times of guided reflection, stillness, and gentle teaching on contemplative Christian spirituality. We'll take time to breathe, to pause and to find deeper communion with God, and we'll draw upon the seasonal themes of Spring to connect with the natural rhythms, seasons and cycles of which we are part. We'll ask how to find a more natural and sustainable 'rhythm of life', the rhythm of the soul. Brian Draper is an experienced retreat leader, writer and speaker. He is author (most recently) of Soulfulness: Deepening the Mindful Life, and a regular contributor to Radio 4's Thought for the Day. He runs seasonal walking retreats and is currently working on a book about nature and Christian spirituality. Brian also contributes to U2.com. A weekend exploring the writings of Evelyn Underhill. Dr Micha Jazz will dig a little deeper into some of Evelyn's writings and prayers reflecting on the relevance today of her work from around 100 years ago. The weekend is split into three events, which can be booked individually or as a 2 or 3 night retreat; Dr Micha Jazz'is a regular presenter on Premier Christian Radio and is the author of the 'Be Still & Know' devotionals in Voice of Hope. A self-styled contemplative Franciscan Friar who, when away from the microphone, enjoys running, along with his wife Jayne, St Cuthbert's Oratory on the South Coast of England. A home of prayer where we explore walking in the Way of God, journeying deeper into the heart of God and serving the mission of God. He also helped birth Spring Harvest, worked as an evangelist with Youth For Christ and was a leader at Revelation Church, Chichester. As an experienced retreat facilitator, Micha brings a wealth of knowledge and expertise. Capture the transformative process of God in our lives as we consider death, life and resurrection through encounters in the Pleshey garden. Revd Hilary Le Seve serves as the parish priest for Wickham Bishops with Little Braxted and as the Assistant Diocesan Director of Ordinands for the Diocese of Chelmsford. She values Pleshey as a space to connect with God and especially its gardens where order and chaos play out their drama and give us glimpses of heaven. A mixed bag of walks. For the ambler as well as the rambler. "Learning to Breathe" Rachel will follow the chapters of her book; "First Breaths" looks at what mental health is, what the Bible has to say about it. "Struggling for Air" looks at the reality of mental illness and exploring a theology of Holy Saturday. "Resuscitation" looks at the role of family, friends and carers. Ending the day on "Learning to Breathe" where we will pull together all we have shared through the day. Rachael Newham (@RachaelNewham is the Founder of ThinkTwice, a Christian mental health awareness charity and the author of "Learning to Breathe". She lives in Hertfordshire with her family and can be found indulging in her love of coffee, books and photography on Instagram! You can expect a warm welcome, space to reflect, to pray and to worship, as well as plenty time to be creative. We shall explore some journeys mentioned in the Bible, and their relevance for our own faith journeys, and enjoy painting as we meander through Pleshey's gardens and surrounding countryside, relating our work to the Biblical journeys or our own if relevant. Christine Phillips (Tutor) trained at Hornsey College of Art and Design and the London Institute of Education. She taught in schools until retiring. Christine tutors a U3A painting groupand has been a practising printmaker for over 30 years.Christine sees her role as an art leader as someone who helps to enable participants to fulfil and enjoy their creativity during the retreat by offering ideas, guidance, suggestions and/or support if required. She will bring numerous art books and different art materials for people to use and for evening activities. Margaret Stein (Chaplain) has been a CARM chaplain and art tutor for a good number of years since working at Carberry Tower, where she ran courses, offered spiritual direction and facilitated worship. She trained at the Edinburgh College of Art before studying theology. With her husband Jock, she is involved with the East Lothian Lantern Group which promotes Ignatian prayer. You can expect a warm welcome, space to reflect, to pray and to worship, as well as plenty time to be creative. We shall explore some of the colours mentioned in the Bible and their significance. Think of the rainbow and the Light of the world! Different colours can be particularly meaningful and influence us in our daily lives. Lots of ideas to make it a colourful week! For the textile aspect of this retreat the theme offers a wide field of inspiration from both the natural world and the man-made one. From sunsets to peacocks or hot air balloons and kaleidoscopes there is plenty to excite you. Bring your sewing machine if you wish and Janet will bring her box of sewing goodies, and we will share the laughter, the stitching and the quiet chapel - all that goes to make Prayer and Embroidery so special. A general requirements list will be sent out nearer the dates. Janet Knox (Tutor) is a long-standing textile leader for CARM, enjoying the creativity and the camaraderie of the retreats. She is an ecclesiastical embroiderer and an enthusiastic hand and machine stitcher welcoming all levels of expertise. Margaret Stein (Chaplain) hails from Scotland; she studied both art and theology and is a retired Church of Scotland minister. She has been involved in CARM retreats for some time, and enjoys the marrying of worship and creativity, with the sharing that happens in a group. A focus on God as Creator drawing on 3 distinct Old Testament traditions, Priestly (Genesis 1), Prophetic (Isaiah 40-48) and Wisdom (Job 28, 38-41). Revd Dr Janet Tollington - after a career in the police service and a short period in retailing Janet trained for the Baptist Ministry and was ordained in 1989. In 1994 she moved to Westminster College, Cambridge (United Reformed Church) to teach Old Testament and Biblical Hebrew in the Cambridge Theological Federation until she retired in July 2016. She has taught adults at every level from interested lay Christians to doctoral students and remains active leading worship and learning events for the church. She delights in working with mixed groups of people, exploring the meaning of the Old Testament for Christians in today's world. Join us for a day exploring the world of angels - what they do, their role in the bible and the music they've inspired. Patrick Craig is a Countertenor Vicar Choral at St Paul's Cathedral, who also directs choirs, leads courses and lectures on theology and music. We were created to be creative. The gifts we have are there to be used, but so many of us see our creative and artistic dreams crushed or even cursed by faulty messages from within and without the church. This retreat is for anyone who wants to meet the creator through the creative, but it's particularly for people who have felt their creative or artistic callings and dreams got lost somewhere along the way. Andy Kind is a comedian, preacher and writer, who has made people laugh around the world for the last 15 years. He loves seeing people's minds change about who they were born to be, by using the creative to point to the Creator. He also loves seeing people bring him whiskey and meat. Christ is in the Everyday as well as in the transcendent. Meditation helps to ground us in the reality of the present moment, as well expanding our consciousness to embrace the universal. Embracing God's love in prayer. It's a reflection on prayer. Bishop Trevor Mwamba is Vicar of Barking, St Margaret's, and Assistant Bishop in the Diocese of Chelmsford, he was formerly Bishop of Botswana. Waiting is never easy. This weekend points the way for anyone who finds themselves in a time of waiting, chosen or unchosen, inviting them to learn and embrace the gifts of patience. Margaret Whipp is a former consultant oncologist, a priest and pastoral theologian, who works in hospital chaplaincy and spiritual direction in Oxford. Although we live in a particular social context, theologically we have (since Pentecost) lived 'between the ages', living in the light of Jesus' ascension and awaiting his return. The Book of Revelation challenges us to live in this time with discipline, facing suffering, but shape by the worship of God as we anticipate that the best is yet to be. Dr Ian Paul studied maths and worked in business before training for ordination in Nottingham and completing a PhD on the metaphorical language of the Book of Revelation. After ten years in parish ministry, and another ten in theological education, he now works freelance teaching, writing and speaking. He is a member of the General Synod and the Archbishops' Council, and is Adjunct Professor in New Testament at Fuller Theological Seminary. Open to all who enjoy celebrating Christmas in song. If you play a musical instrument, please bring it with you. The day also includes a festive lunch. Over recent years we have had 3 wonderful Retreats at Christmas. This is open to all but is particularly there for those who might normally spend Christmas on their own. This is not a silent retreat, but nor is it a 'party'. There will be opportunity for those who wish to, to have quiet space but it is also time for people to have a comfortable, relaxed time together. Arriving any time after 1:00pm on Christmas Eve through to leaving by 2:00pm on Boxing Day, the time together offers the opportunity for fellowship, fun, quiet, relaxation and good food!